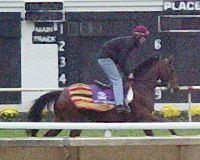 On on a gloomy, rainy, and freezing Friday morning, lots of Breeders' Cup entrants trained over the sloppy track or schooled in the paddock at Arlington. This was the last chance for most to get any work on the main track as they may not open it for training on Saturday morning. Today was the first chance for some of the Europeans to go out after clearing quarantine and the big attraction of the day was Rock of Gibraltar. Because so many horses went out today, I had to split this into two parts. Below are the horses from the Mile, Classic, Distaff, Turf, and Sprint. For horses from the Filly & Mare Turf, Juvenile, and Juvenile Fillies check here. Check here for Thursday's morning workouts. Click on the small image to see a larger version. Rock of Gibraltar on the turf course and heading back to the barn after his work. Mile favorite Rock of Gibraltar came out for a canter on the yielding turf course today after clearing quarantine yesterday. 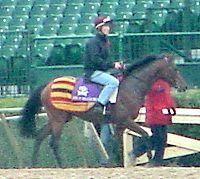 Forbidden Apple galloped twice around the main track. The 15-1 shot is sure to be on the lead early in the mile. 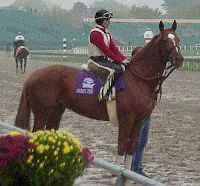 Green Fee, a 50-1 longshot in the mile, took a 2 mile gallop this morning. 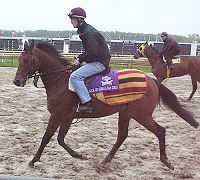 Aidan O'Brien's other Mile entrant, Landseer, also went for a canter on the turf course this morning. 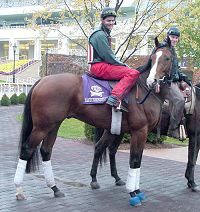 Aidan O'Brien trained Hawk Wing will run for the first time on the dirt in the Classic. He got his first taste of an American style sloppy track today for his first out since clearing quarantine yesterday. Classic longshot Volponi jogged around a couple of times. Distaff starter Summer Colony jogged a mile and galloped 1 1/8 miles this morning. 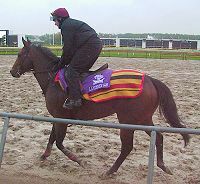 Trainer Mark Hennig said: "She has handled most any track we have thrown at her. I get the impression she will handle it fine. 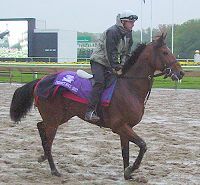 We wanted to make sure we gave her a good gallop over it today, in case we get this (sloppy track) Saturday." Distaff second choice Take Charge Lady galloped 1 1/4 miles in her first spin over the Arlington tack since arriving from Churchill Downs. Turf favorite High Chaparral cantered over the yielding turf course today. Perfect Soul, the longest shot on the board for the Turf, galloped 1 1/2 miles over the turf course. Fan favorite Xtra Heat was out for a 1 1/2 mile gallop in her final prep before the Sprint. Sprint entrant Crafty C.T. was out for a gallop this morning. 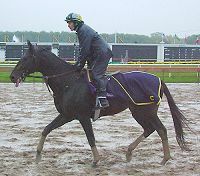 His trainer Howard Zucker said: "He seemed to like the slop pretty good. We don't have the chance to train in the slop in California that much, because they close the main track at Santa Anita when it rains too much." Sprint 15-1 shot Disturbingthepeace galloped 1 1/4 miles today. 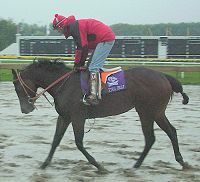 Thunderello, a 50-1 longshot in the Sprint, jogged 1 1/8 miles on the main track. Review: Crushing the Cup 2002 - an essential tool for anyone trying to handicap the Breeders' Cup races. NEW! Breeders' Cup Postcards - Breeders' Cup theme virtual postcards to send your friends NEW! Breeders' Cup Video Preview - online video of all the prep races leading up to the Breeders' Cup. Requires you sign up for a free userid and password to access this. NEW!